The Day of the Crimean Tatar National Flag is celebrated annually in the Crimea and in the mainland Ukraine. Exactly one hundred years ago, in 1917, the Crimean Tatar National Flag was approved on the first Kurultai of the Crimean Tatars, historian Gulnara Abdulayeva reported at the press conference dated for the celebrating of the Day of the Crimean Tatar National Flag, according to the QHA correspondent. The blue color was not chosen by chance for the flag. In Ancient Turks times Kok bairak (flag – Ed.) meant sky-blue color, and symbolized peace, justice, good, unity of the people, heaven and purity, according to the historian. “The tarak tamga, which is in the upper right corner of the flag, has a more ancient history. It is believed that it emerged in this form at the turn of the XII - XIII centuries. On one of the versions, Girays dynasty who ruled the Crimean Khanate from Jochi, the eldest son of Genghis Khan inherited this symbol”, Abdulaeva said . To date historians still cannot come to the common opinion on the tamga semantics origin: according to one version, it means the unity of the people, that is, the three families (tribes) that took part in the ontogeny. On another version, tamga symbolizes the Crimean Khan and his Heirs, she noted. “Most historians consider tarak tamga a symbol of justice and the image of the weights. Dr. Hakan Kırımlı proposed this version for the first time," the historian said. In the 1920s, during the occupation of Crimea by the Wrangel army, the Crimean Tatar Flag was adopted as a national flag. Then it was adopted as a national flag in June 1991 at the second Kurultay of the Crimean Tatars. “That’s not to say that the Crimean Tatars had no national flag before 1917. During the period of the Crimean Khanate, they had flags reflecting the tribes. Each tribe had its own tamga that had been undergone modifications and were inherited. Crimean Tatar historians have discovered about 400 tamga species”, Abdulaeva said. Day of the Crimean Tatar National Flag is celebrated annually in the Crimea and in the mainland Ukraine, starting from 2010. This year the official date of the holiday – June 26 – has been chosen officially for the first time. “The Crimean Tatar youth initiated the celebration of the Flag Day. They organized the celebration themselves for the first time. Then in 2010 the Mejlis adopted this day as the Day of the Crimean Tatar National Flag”, the Member of the Mejlis of the Crimean Tatar People, Reza Shevkiev said. 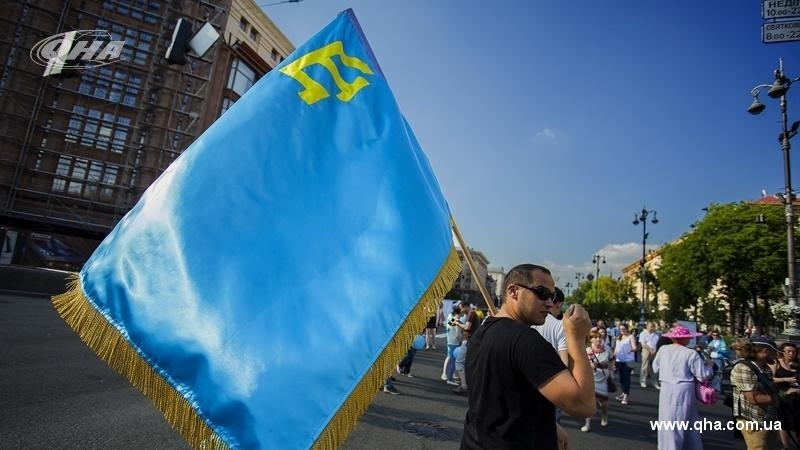 Earlier QHA reported that on June 26, on the Day of the Crimean Tatar National Flag, two flags – Ukrainian and Crimean Tatar – had been raised over the Kyiv office of the Mejlis of the Crimean Tatar People.